In my question to own any and all comic appearances of Hellboy, I finally picked up a copy of Savage Dragon/Hellboy, which collects two issues of Erik Larsen’s Savage Dragon comic featuring a guest appearance by the wielder of the Right Hand of Doom. Quick history lesson: In 1992, when the post-Batman comic book boom was at its peak, a number of Marvel Comics’ most popular artists left to start a new company called Image Comics. While Image’s fortunes have waxed and waned over the years (they currently publish the bestselling Walking Dead), two original Image titles have continued ever since those early days: Todd McFarlane’s Spawn and Erik Larsen’s Savage Dragon. The Dragon is a green-skinned, super-strong fellow with a big green fin on his head and an (until recently) unknown origin. He appeared in a blaze of fire with no memory of his past and was recruited to fight (supervillainous) crime by the US government. Hellboy is a red-skinned, super-strong fellow with filed-down horns on his head and an (until recently) unknown origin. He appeared in a blaze of fire with no knowledge of his past and was recruited to fight (supernatural) crime by the US government. It was perhaps inevitable that these two indie comic juggernauts meet. It happened in the pages of Savage Dragon #34-35, a relatively self-contained story in which the Dragon and Hellboy confront Brainiape (yes, Brainiape), yet another superintelligent gorilla in comics’ long love affair with smart simians. However, Brainiape’s enhanced intellect is the result of his having Hitler’s brain, which was swiped from his decapitated head after Hellboy blew up Hitler’s mechanized suit in 1952. Every single issue of Savage Dragon has been written and drawn by Larsen, a rare feat in the industry and one matched only by Dave Sim’s Cerebus. These two issues were collected into a trade paperback to capitalize on Hellboy’s popularity. 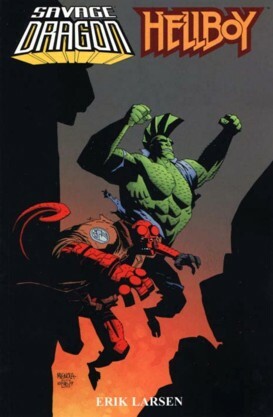 Larsen’s art style in these issues is obviously intended to mimic Hellboy creator Mike Mignola’s distinctly minimalist style (especially the first two or three pages). There’s also some sort of Godzilla-like monster and a subplot about a dying supervillain. Ultimately, there’s not really enough character interaction between the Dragon and Hellboy to make the story interesting; you could substitute any bruiser in there and the story would basically be the same. But Larsen does add a few of Hellboy’s signature traits (his use of the truncated “son of a–“, his terrible aiming, and Hellboy’s appearance on the cover of Life magazine), and the art is fantastic. Larsen, like Mignola, is one of the best artistic acolytes of Jack Kirby, and that really shines in Savage Dragon/Hellboy.